Great attendance. I wrote a post on it, as did Wirehead, and others I’m sure. 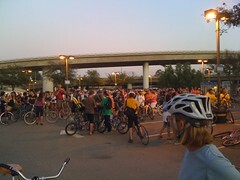 Organized by San Jose cyclists, it’s a “this is how we ride,” more tame version of group bike rides. Started, I was told, by a few guys who like to get together and ride, this event grew to 4K (at the second stop). I turned off at the first stop. Yesterday at Zeitgeist I ran into a dozen or so chopper riders who were also at the ride. “We spun off for some beers,” one told me. Also ran into some other SF Metblogs emeritus writers, in San Jose. Seems like the thing to do, for cyclists. Comment below if you attended! I circled the Bay basically on bike + public transit. 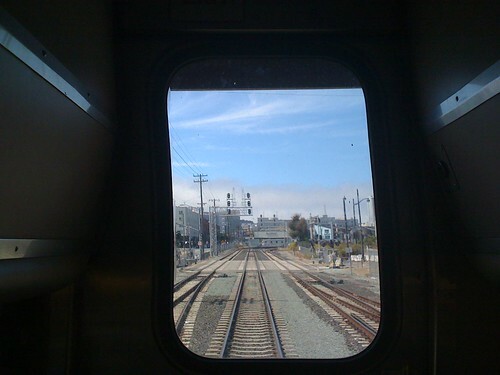 Amtrak to San Jose ($15 from Emeryville), Caltrain ($7) to MUNI ($2) and then cycled back home to North Beach.